With Christmas just around the corner, families all around the world will be getting into the swing of things in terms of all the tasty goodies that come with the season. 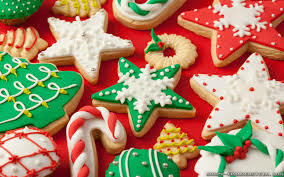 Christmas baking has long been a huge family tradition for millions of families and is not just a great family activity but also provides you the opportunity to do something that doesn’t involve electronics or even spending a lot of money, aside from purchasing ingredients. We all know that quality family time is highly important to a child’s development, and what better way than to teach them a valuable skill at the same time? What is your family’s favourite baked good for the holidays? Shortbread and ginger snaps are usual go to’s for baked goods over the holidays and for good reason. They both conjure up images of Christmases past with roaring fires and cups of warm mulled wine inside by the Christmas tree. These special treats tend to only come out around Christmas time, with the exception of shortbread which does tend to be enjoyed year round. So what is your favourite shortbread recipe? Ours is below! This recipe is perfect for #AFamilyFeast and with so few ingredients and such little prep and baking time, is a great first shortbread recipe for kids and adults alike. Whip butter until a fluffy consistency. Stir in sugar, cornstarch and flour. Beat on low for one minute, then on high for three to four minutes. Spoon onto cookie sheet about two inches apart*. Bake 12-15 minutes, making sure that the edges don’t brown too much. Put on wire racks to cool. *You can add festive red, green and white sprinkles to the pre-baked dough for an extra festive treat. See? So easy that it’s perfect for kids of any age! If your children are still quite small you can get them involved by getting them to sprinkle the sprinkles or by spooning the dough onto the cookie sheet. With recipes this easy, everyone can get involved! And not only that, but it’s super easy to do in even just an hour, so there’s really no excuse as to why you can’t take an hour out of your day to spend bonding with the kids over a cool shortbread recipe! For more awesome recipes, check out the short ebook by Worktop Express included below. Baking is just one tradition that families enjoy at Christmas, but why not get the kids involved in the dinner as well? From peeling veggies to mashing potatoes, even the smallest of kids can get involved somehow, even if it’s just opening a can of cranberry sauce for that big delicious turkey! So what Christmas traditions does your family love? Be sure to take some time this Christmas to show those you care about just how much you care by spending quality time with them. So if you’re looking for a great way to get everyone involved this Christmas, look no further than baking. Such an easy way to bring everyone together and the end result is goodies to share over your favourite flicks – Christmas themed or otherwise. Merry Christmas!